Nikon: Pre-orders for the D800 Are "Unprecedented"
Nikon may have correctly bet on the specs of the D800 and its price. Based on this TechRadar report, Nikon received better than expected orders for the new Nikon D800 and D800E full frame DSLR cameras that feature the world’s highest resolution full frame CMOS sensor. According to Nikon, the Nikon D800 and D800E are aimed at medium format users and portrait photographers, and are not replacement of Nikon D700. The report also said the pre-orders for the Nikon D800E is also higher than anticipated but Nikon is cautious about users who may not be fully aware of the consequences of removing the anti-aliasing filter. The popularity of Nikon D800 can be seen on Amazon. 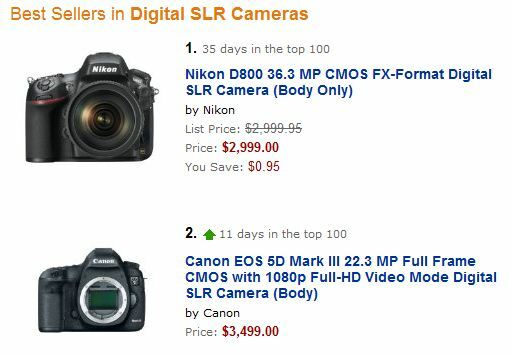 The Nikon D800 is currently the best seller on the Amazon’s DSLR best seller list. The Canon EOS 5D Mark III currently takes the second spot. In the best selling electronics category, Nikon D800 ranks at #19 and Canon EOS 5D Mark III comes in at #73. That’s two spot below its high end compact camera, the Canon PowerShot S100. Readers should be aware that the rankings change frequently and at the time of reading the numbers may have changed completely. The above is a snapshot as of 7AM MDT, March 12, 2012.